say bonjour to something new. Our beef is a combination of pure grain-fed Riverina Angus and Wagyu beef cooked to melt-in-your-mouth perfection (slightly pink) with no additives or preservatives. Our chicken is free-range Lilydale chicken breast, delicately seasoned with garlic and thyme. Our pork is free-range Rivalea ground pork, dusted in chorizo seasoning for a smoky flavour with a hint of garlic and sweet paprika. Our bacon is double-smoked bacon rashes, sourced from a local award-winning bacon producer. Our artisan sauces are made to our high standards by specialist chefs and their combination is designed to enhance the flavour of each burger and make them distinctly unique. Our gluten free and vegetarian options are made to the same gourmet standards that we insist on for all our burgers. Best in class and so good even meat lovers will be surprised with their quality. Our menu is also Halal accredited. See the Halal Menu for those items that have been certified Halal. Toasted Pain de Mie milk bun, Mustard dill pickle mayonnaise, Crisp fresh lettuce, Tomato, House-made L’Pickle salsa, House-made tomato onion jam, Artisan tomato sauce, Grilled free range Angus/Wagyu beef patty (served pink), and topped with melted Gruyere cheese mix. Toasted Pain de Mie milk bun, Lemon caper mayonnaise, House- made L’Slaw, Tomato, Garlic aioli mayonnaise, Free-range grilled chicken breast or Southern-fried free-range chicken breast. Toasted Pain de Mie milk bun, Mustard mayonnaise, Crisp fresh lettuce, Tomato, L’Pickle house-made salsa, House-made tomato onion jam, Garlic aioli mayonnaise, Grilled free-range chorizo pork patty. Toasted Pain de Mie milk bun, Special mustard mayonnaise, Crisp fresh lettuce, Tomato, Red onion, Artisan tomato sauce, and a Grilled house-made Cevapcici style pork/beef/lamb seasoned patty (mildly spicy). Toasted Pain de Mie milk bun, Chipotle mayonnaise, Crisp fresh lettuce, Tomato, Grilled sliced red capsicum, House-made L’Pickle salsa, Garlic aioli mayonnaise, with a Potato, corn and broccoli vegetarian patty. Toasted Pain de Mie milk bun, Mustard mayonnaise, Artisan tomato sauce, Pickles, Grilled free range Angus/Wagyu beef patty (served pink), and topped with melted Gruyere cheese mix. all our meat has no preservatives or additives. We try to serve our beef slightly pink - please let us know if you would like it well done. Toasted black Pain de Mie milk bun, Porcini mushroom mayonnaise, Crisp fresh lettuce, Tomato, L’Pickle house-made salsa, House-made tomato onion jam, Hickory BBQ sauce, Grilled Angus/Wagyu beef patty, topped with melted Gruyere cheese mix and two slices of Double smoked crispy free-range bacon. Toasted black Pain de Mie milk bun, Chipotle mayonnaise, Crisp fresh lettuce, Tomato, House-made Jalapeno salsa, House-made tomato onion jam, Garlic aioli mayonnaise, Grilled Angus/Wagyu beef patty (served pink), topped with melted Gruyere cheese mix and a generous serving of fiery Sriracha sauce. Toasted black Pain de Mie milk bun, Chipotle mayonnaise, House-made L’Slaw, Tomato, House-made Jalapeno salsa, Grilled free-range chicken breast, and a generous serving of fiery Sriracha sauce. Toasted black Pain de Mie milk bun, Lemon caper mayonnaise, Crisp fresh lettuce, House- made L’Slaw, Tomato, House-made L’Pickle salsa, Chipotle mayonnaise, and a generous serve of Panko crumbed fried prawn cutlets. Toasted black Pain de Mie milk bun, Garlic aioli mayonnaise, Crisp fresh lettuce, Tomato, Grilled mushroom, Marinated eggplant, Grilled zucchini, Lemon caper mayonnaise, with crunchy Butternut, goat’s cheese and beetroot vegetarian patty. Toasted black Pain de Mie milk bun, Chipotle mayonnaise, Crisp fresh lettuce, Tomato, House-made lime, corn and avocado salsa, Grilled mushrooms, House-made Jalapeno salsa, with a crunchy Mixed bean, mozzarella cheese, sweet potato, and cumin and paprika inspired vegetarian patty. A hint of smokiness and spice (mildly spicy). Toasted Pain de Mie vegan bun, Special vegan mayonnaise, Crisp fresh lettuce, Tomato, Grilled zucchini and Red capsicum, with a crunchy seasoned Broad bean, pea and spinach vegan patty. Toasted Pain de Mie vegan bun, Special spicy vegan mayonnaise, Crisp fresh lettuce, Tomato, Grilled zucchini and Red capsicum, House-made Jalapeno salsa with a crunchy seasoned Broad bean, pea and spinach vegan patty. See our in-house board for our latest speciality burgers. We are going around the world in 26 burgers. Toasted Pain de Mie milk bun, Lemon caper mayonnaise, House- made L’Slaw, Tomato, Garlic aioli mayonnaise, Free-range grilled chicken breast or Southern-fried free-range chicken breast..
Toasted Pain de Mie milk bun, Chipotle mayonnaise, Crisp fresh lettuce, Tomato, Grilled sliced red capsicum, House-made L’Pickle salsa, Garlic aioli mayonnaise, with a Potato, corn, and broccoli vegetarian patty. Toasted Pain de Mie milk bun, Mustard mayonnaise, Tomato sauce, Pickles, Grilled free range Angus/Wagyu beef patty (served pink), and topped with melted Gruyere cheese mix. Toasted black Pain de Mie milk bun, Lemon caper mayonnaise, Crisp fresh lettuce, House-made L'slaw, Tomato, House-made L'Pickle salsa, Chipotle mayonnaise, and a generous serve of Panko crumbed fried prawn cutlets. Toasted black Pain de Mie milk bun, Garlic aioli mayonnaise, Crisp fresh lettuce, Tomato, Grilled mushroom, Marinated eggplant, Grilled zucchini, Lemon caper mayonnaise, with a crunchy Butternut, goat's cheese & beetroot vegetarian patty. Toasted black Pain de Mie milk bun, Chipotle mayonnaise, Crisp fresh lettuce, Tomato, House-made corn and avocado salsa, Grilled mushrooms, House-made Jalapeno salsa, with a crunchy Mixed bean, mozzarella cheese, sweet potato, and cumin and paprika inspired vegetarian patty. A hint of smokiness and spice (mildly spicy). Toasted Pain de Mie vegan bun, Special vegan mayonnaise, Crisp fresh lettuce, Tomato, Grilled zucchini and Red capsicum , with a crunchy seasoned Broad bean, pea and spinach vegetarian patty. Toasted Pain de Mie vegan bun, Special spicy vegan mayonnaise, Crisp fresh lettuce, Tomato, Grilled zucchini and Red capsicum , House-made Jalapeno salsa, with a crunchy seasoned Broad bean, pea and spinach vegetarian patty (spicy). Toasted Pain de Mie milk bun, Chipotle mayonnaise, Crisp fresh lettuce, Tomato, Grilled sliced red capsicum, House-made L’Pickle salsa, Garlic aioli mayonnaise, with a Potato, corn and broccoli vegetarian patty. (Gluten Free option available). Toasted black Pain de Mie milk bun, Garlic aioli mayonnaise, Crisp fresh lettuce, Tomato, Grilled mushroom, Marinated eggplant, Grilled zucchini, Lemon caper mayonnaise, with a crunchy Butternut, goat's cheese and beetroot vegetarian patty. (Gluten Free option available). Toasted black Pain de Mie milk bun, Crisp fresh lettuce, Tomato, House Chipotle mayonnaise, House-made lime, corn and avocado salsa, Grilled mushrooms, House-mad Jalapeno salsa, with a crunchy Mixed bean, mozzarella cheese, sweet potato, and cumin and paprika inspired vegetarian patty. A hint of smokiness and spice (mildly spicy). (Gluten Free option available). Toasted Pain de Mie slider milk bun, Artisan tomato sauce, Junior sized grilled Angus/Wagyu beef patty, melted Gruyere cheese mix, and a junior serving of crunchy fries. Toasted Pain de Mie slider milk bun, Crisp fresh lettuce, Tomato, junior size grilled free-range Chicken breast, tomato sauce, and a junior serving of crunchy fries. A double serving of fries with a combination of sauces and seasonings. See menu board for latest offers [changes fortnightly]. Suitable for 2 or more persons. A treat on their own or the ultimate accompaniment with our delicious burgers. Icy cold creamy chocolate malt with artisan Australian chocolate syrup, 2 generous scoops of ice cream, the essential scoop of malt and some L'Burger love and magic. Top this off with whipped cream and crumbled Kit Kat. Yum - a classic. Icy cold creamy strawberry malt with artisan Australian strawberry syrup, 2 generous scoops of ice cream, the essential scoop of malt and real strawberry fruit and cream cheese. Add some L'Burger love and top this off with whipped cream. Lusciously creamy. Sometimes you just want life to be simple and dare we say it 'Vanilla flavoured'. Start with ice cold full cream milk, add 2 generous scoops of vanilla ice cream, malt and some home-grown artisan Vanilla syrup. Mix it well and top it off with whipped cream and crumbled honeycomb. Simple and always delicious. Sweet or salty? Can't make up your mind .... have both. Start with ice cold full cream milk, add 2 scoops of ice cream, a generous serving of Australian caramel syrup, add crushed salty pretzels and malt. Mix well and then top off with whipped cream and decorate with a pretzel. Yeah baby! Each month we design something new and release a new malt for diners to try. See the menu board for our latest sensation. Served ice cold and with the best of ingredients. 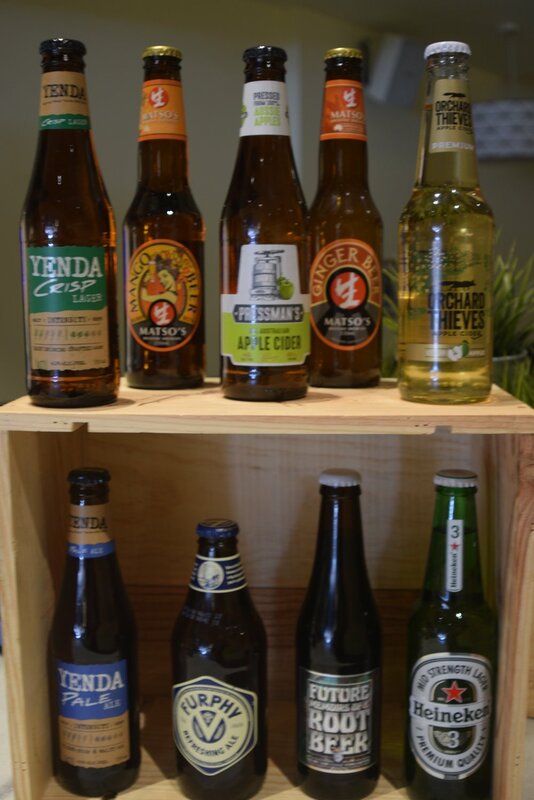 Local and imported beers, Apple ciders, and a wonderful Root beer. Please refer to our in-house Drinks Menu when you order. House-made Belgian waffle with chocolate Oreo cream cheese, gooey choc fudge sauce and accompanied with warm crème anglaise and vanilla bean ice cream. For lovers of chocolate. House-made Belgian waffle with mixed fruit lemon scented cream cheese, mixed fresh berries, mixed berry coulis, and accompanied with warm crème anglaise and vanilla bean ice cream. A classic. House-made Belgian waffle with stewed cinnamon apples, salted caramel sauce and accompanied with warm crème anglaise and vanilla bean ice cream. Simple and delicious! House-made Belgian waffle with maple syrup and vanilla bean ice cream. Follow our Instagram page (lburger3122) and see what were designing for this month's special waffle. Always interesting and always yum! Waffle of the Month for November - Follow us on Instagram (lburger3122) and see our latest Waffle of the Month listed in store. Always interesting and always a treat! & so do others - See the latest reviews on Google and Zomato. L’Burger is more than an everyday burger, bringing together premium ingredients, gourmet sauces and superior service. We’re passionate about our burgers — we think you will be too. We’re proud to support specialist local food producers, and all our meat products are delivered fresh, never frozen. L’Burger is a more than an everyday burger. Are you planning a function, celebration, or office get together, and need somewhere for up to 80 people to dine in a group? At L’Burger in Hawthorn we have great space for groups from 6 to 80 diners to have a casual meal and mingle. All in a licensed dining space with table service. We have experience in catering for medium to large groups and can dedicate space specifically for your group. We can customise a menu to suit your own needs and we also cater for special dining requirements (vegetarian, vegan, gluten free, and Halal). Contact us today and discuss your needs.